I seen this Cocktoo bird during our vacation last couple of days ago in Indiana its to funny when I saw him he is more funny bird than I seen before we use to have a parrot bird couples of years ago when hubby got our parrot bird, parrot can smart bird too. This cockatoo bird are pretty smart and in good in personality because they have pretty feather sweet, playful, and intelligent, They have bare-Eyes its becoming more and more popular as pets in the home. Its to funny though when us together at the big park I see this bird and he eat cheap I mean the snack cheap that human eat I am surprise this bird can talk he is to cute the way he talk he can say " I am hungry, I need food more, thirsty and many words. Apparently bird can pick word from the person they heard as I knew from the owner this bird is seven years old they had him three year ago its so nice to raise a bird at your home at least you have something to talk its fun though. If you are a bird lover the this is the bird you want to have in your home. 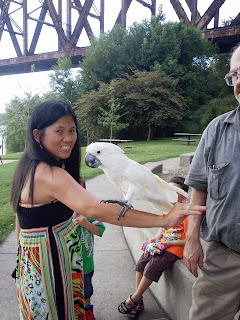 We used to have a bird I feel sad that parrot bird is gone he just got bite from the wild animals, before he got sick and die he was happy to see us around the house so sad I only see him in the picture. We buried him in our back yard. Before that happen we see him him he talk a lot at his cage, I am talking with my parrot anyhow good thing I see this another bird at the park its reminds me our beloved bird his name is Pete its wonderful days in our life to many memories for our Pete. Wow! What a beautiful bird! I wish to hear it talk too. So sorry about your bird. That one is really pretty. Its nice to learn something from that bird, never thought that parrot has different kinds. Because when you just take a look at it, my impression is just a parrot, not knowing it's a different family bird.